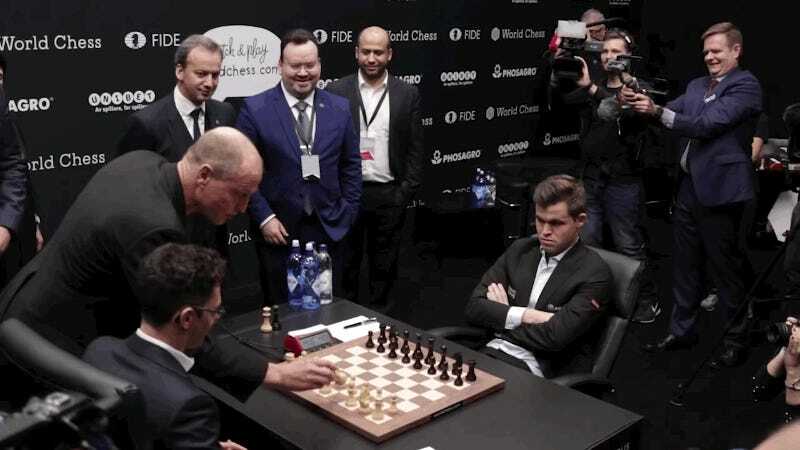 Actor Woody Harrelson was in London for today’s start of the World Chess Championship between grandmasters Magnus Carlsen and Fabiano Caruana. Harrelson thought he’d lighten up the tense 12-game match with a little joke during the first move ceremony—chess’s version of a first pitch or puck drop, basically. Instead, it mostly left everyone perplexed. Caruana was playing the white pieces, so he had the first move. When Harrelson moved the queen’s pawn—1.d4 for those scoring at home—he knocked over Caruana’s king, which is the overdramatic sign for a surrender. The gag did not land with the dry crowd. Harrelson moved the wrong pawn, everyone awkwardly shook hands, then he returned to the board to fix his mistake. Harrelson said his tipping of the king was intentional, but he messed up the actual move. Caruana wanted to open with the king’s pawn (1.e4). The challenger consulted an official, who reset the board, because not even chess could be that stuffy about such a meaningless goof. It had no effect on the game itself, which ended in a draw after seven hours. There are 11 more contests over the next couple of weeks that Woody can’t mess up.